Home Eastmans Share Your Story! The final and perhaps most rewarding step in the pursuit of your western big game trophy of a lifetime is sharing your story with us so we can share it with our readers. 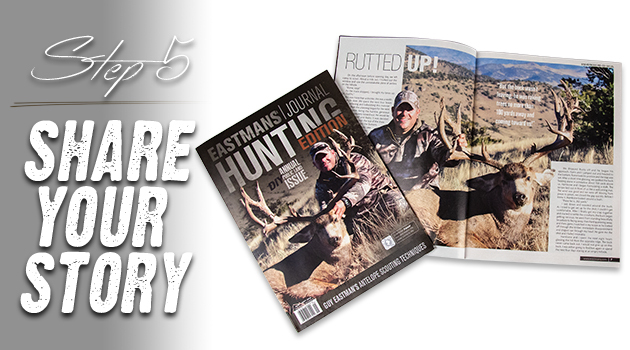 There is no other western big game publication that reaches as many people as Eastmans’ Hunting Journals and no other company champions the ethic of fair chase hunting and conservation like the original, Eastmans’. If your submission is chosen to appear in an issue of either Eastmans’ Hunting Journal or Eastmans’ Bowhunting Journal you will be automatically eligible for free gear from our fine sponsors. However, the real reason to share your story is to pass along your passion for fair chase western big game hunting to the Younger Generation. It is no secret that as a nation we have lost over 2 million hunters in the past decade. Therefore, it is our responsibility to tell the stories of why we hunt, why we love big game animals and the wild places they call home, so that we can attract new brothers and sisters to our diminished ranks. As if that weren’t enough, sharing your story celebrates the success of the North American Model of Conservation. No place on earth has been as successful as North America in the management of wildlife and our hunting heritage plays a dominant role in that saga. By recounting your adventures and sharing them with Eastmans’ Hunting Journals family you are spreading the positive image of hunters to a wide audience. We as hunters need to exalt each other and our shared passion if we are going to pass the torch to another generation of hunters and conservationists. Our narratives must resound in the public ear and nothing does that better than the written word with engaging images, both of which you’ll find in the pages of Eastmans’ Hunting Journals. So don’t wait, subscribe today, begin your research with the Eastmans’ MRS sections, study the best tips and tactics, review the hottest gear and get cracking on your dream hunt and western big game trophy of a lifetime! And after it’s all said and done submit your story and photos for a chance to be featured in the premier western big game hunting publications, Eastmans’ Hunting Journals. The post Share Your Story! appeared first on Eastmans’ Official Blog | Mule Deer, Antelope, Elk Hunting and Bowhunting Magazine | Eastmans’ Hunting Journals. Previous articleSixsite Gunnison Jacket And Clear Creek Pant Giveaway! Next articleGrizzly Bear Crisis In Wyoming!